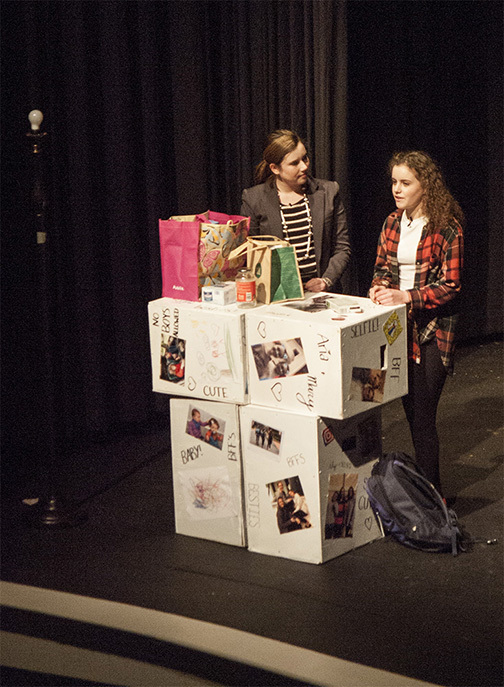 As part of the programming for Martin Luther King Jr. Day at Saint Mary's, the school's St. Genesius Players performed Text This by Tim Mogford, and the Theatre Arts 1 class performed Lightbulb, an original play written by the class. Both plays were being produced by the Technical Theatre class. In the production program, Theatre Director Lou Catania '77C reflected on the words of Dr. King and offered context for the plays in her Letter from the Director. "I have a dream that my four little children will one day live in a nation where they will not be judged by the color of their skin, but the content of their character." Martin Luther King, Jr. spoke these words in his famous "I Have a Dream" speech on August 28, 1963, at the March on Washington." I remember in the 60s when I was in the third grade at Graham Elementary School in Shelby, N.C., there was one black girl in my class. Her name was Gloria. In preparation for parent night, Miss Clonniger assigned us all with drawing and coloring a self-portrait. All afternoon we worked on our masterpieces until it was time to hang them on the wall outside our classroom. There they hung, with different colors of clothes and hair. The one that stood out was Gloria's. She had carefully colored herself white, not with e Crayola peach, like the rest of us, but white. Event at eight years old, this troubled my heart. Why hadn't she used the mahogany crayon which would have represented her beautiful skin tone? I was struck by the pain of her non-belonging. Martin Luther King Jr. fought for the rights and safety of the African American community and in doing so pleaded with all Americans, including eight-year-old me, to show compassion, empathy, and love. The plays today center on examining character and who we are at our core. Martin Luther King Jr. was a man of great faith in God. I will end with a statement of unity from that same speech, "With this faith we will be able to transform the jangling discords of our nation into a beautiful symphony of brotherhood."